OMA's New York office has unveiled renderings for a 490,000-square-foot mixed-use retail and office project in the Boston Seaport—OMA's first in the city. OMA’s New York office has unveiled renderings for a 490,000-square-foot mixed-use retail and office project in Boston—OMA’s first in the city. The project will be located in the Boston Seaport and is being backed by Massachusetts-based WS Development. The developer has coalesced around a number of esteemed firms, notably Sasaki, NADAAA, and James Corner Field Operations as the firm looks to invest in the area, plotting a wider 1.3 million-square-foot scheme. 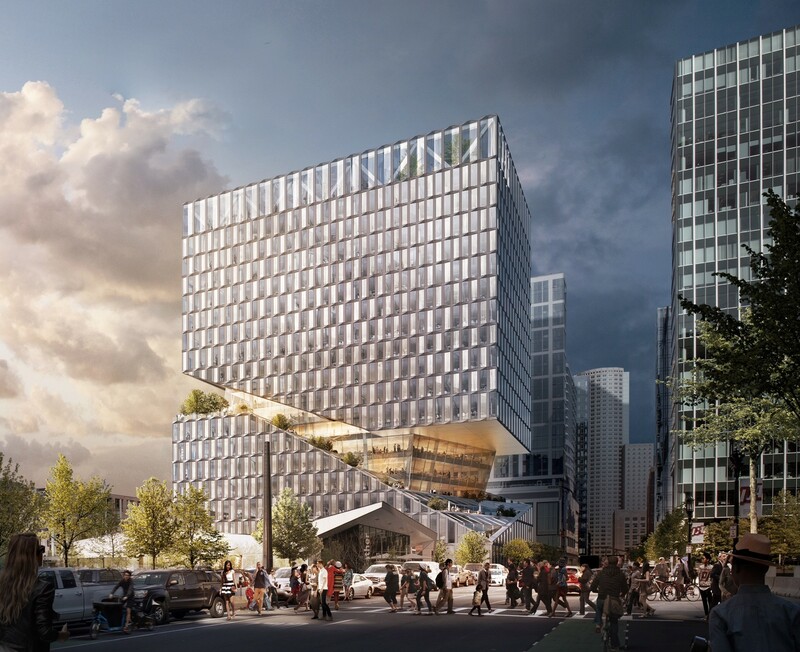 Officially known by its address at 88 Seaport, the project is set to offer a series of cascading terraces that form part of a dramatic, angled slice through the structure about a third of the way up. This cut-through transcends down from a mid-level balcony through the building towards the street corner, with its angularity encouraging views up and into the cantilevered structure. 88 Seaport is also orientated toward Boston’s Fan Pier Green and the water’s edge, and while its windows are recessed, the render depicts floor-to-ceiling fenestration which will maximize views out. The building will rise to 18 floors and provide almost 425,000 square feet of office space. Meanwhile, 60,000 square feet will be designated for retail on the first two levels. Finally, 5,000 square feet will be allocated for civic and cultural use. The project is expected to break ground next year with completion planned for 2020.